Rahm says voters who want an elected school board have been 'tricked'! 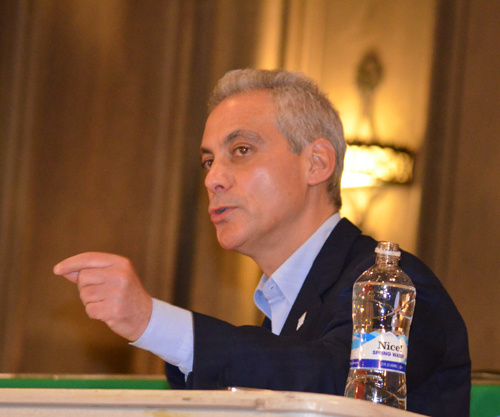 At the �Chicago Women Take Action� mayoral forum on January 24, 2015, Mayor Rahm Emanuel said people had been �tricked� into wanting an elected school board. With a referendum scheduled in the majority of the city's wards on February 24 on the elected school board, Chicago's mayor stated his position clearly to the crowd at the Chicago Temple for the widely publicized event. 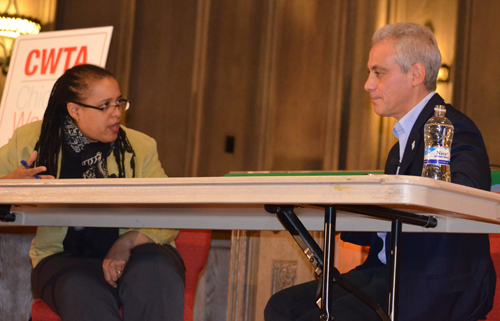 NPR�s Cheryl Corley interviews Mayor Rahm Emanuel. Chicago Women Take Action's co-founder Marilyn Katz said the organization had given Corley all the questions it had compiled to use in whatever way she wished. Substance photo by Sharon Schmidt.The moderator of the forum, NPR�s Cheryl Corley, introduced the topic by noting that Chicago is the only district in the state that doesn�t have an elected school board. �The governor doesn�t want it; the legislature doesn�t want it,� he said. Emanuel said that Chicagoans do have �local control� and "accountability" in the Local School Councils (LSCs) and that he plans to revitalize the LSCs. Emanuel spoke about some of his education policies in his introductory remarks and during the question and answer session with Corley. In addition to the LSC plans, he also spoke of strengthening the neighborhood high schools with STEM and IB programs. Emanuel did not mention charter schools, despite his major expansion of charters. Charter schools don�t have LSCs. Charter schools have cut resources for neighborhood schools. Prior to his control of the schools, Emanuel said, the �system was not set up for our kids.� When asked about school closings, Emanuel said they were �part of a series of things,� that he said improved the schools. The audience applauded when Corley asked Emanuel if he looking back he would have closed fewer schools. The forum at the Chicago Temple 77 W. Washington St., which began with an introduction by co-founders of the �Chicago Women Take Action� organization Marilyn Katz and Jacky Grimshaw, was not a debate. It featured Emanuel, and mayoral candidates Ald. Robert Fioretti (2nd Ward), Cook County Commissioner Jesus �Chuy� Garcia, Willie Wilson, and William �Dock� Walls separately, in alphabetical order.